Saturday, November 4, at the Charleston to Charleston Literary Festival opened with Divided We Stand: The Battle Over Women's Rights. 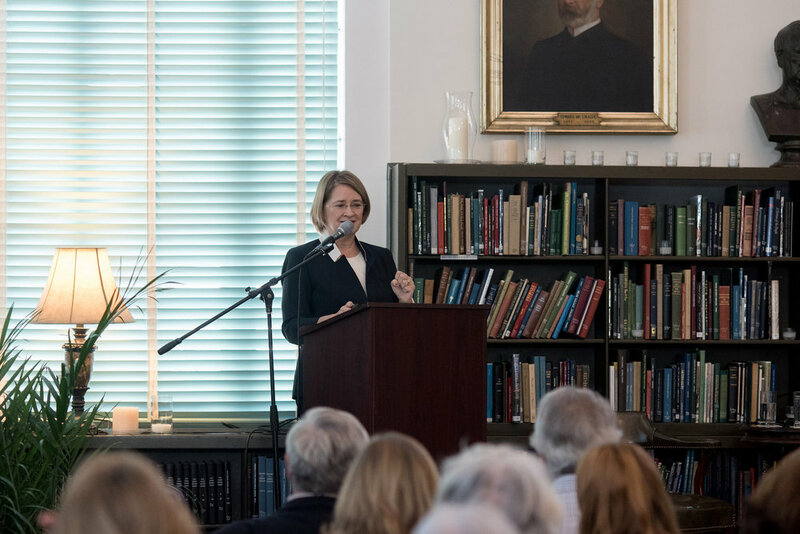 Marjorie Spruill, historian and professor at the University of South Carolina, spoke about her new book, Divided We Stand, which was recently named one of the Smithsonian Magazine's top ten history books of 2017. In discussion with Spruill on this important, timely topic were Belinda Gergel, former Chair of the History and Political Science at Columbia College, and Margaret Bradham Thornton, award winning editor of the Notebooks of Tennessee Williams. Together, the three speakers treated guests to a discussion of the National Women's Conference of 1977 in Houston, Texas,and how it shaped the face of women's rights since then. The timely and often heated subject of women's rights was given a new framework by this group of scholarly, entertaining speakers, and as you'll see from the photos below, there was no contentiousness to be found in the Charleston Library Society's main reading room that morning.